As a general statement, that is hard to argue with, and we will certainly use the “beginning, middle, and end” bit. Remember that Aristotle also said, “the life and soul” of story “is the plot.” Aristotle goes on to define plot as “…the combination of the incidents, or things done in the story,” [Poetics 6] which is so vague that it’s no help at all. Something is missing. We need precise directions. Something actionable. This is actually good advice. It tells us that we should have someone we care about and what should happen at the beginning and end. The problem, of course, is that a “complicating situation” can be anything and isn’t actionable. It’s a vague term that may have nothing to do with conflict. Advanced calculus is complicated, but it has nothing to do with conflict. If the central conflict generates the “sequence of episodes,” they do have “probability” and “necessity,” which clearly satisfies our requirement of having a certain inevitability, or as I term it, cause and effect. Also, since story is about conflict, until it occurs nothing is worth stating, and when it ends, nothing else is worth telling — all this in keeping with Aristotle’s definition of the beginning and ending. So we need something that tells us more about the central conflict, and perhaps it should be true of all conflict. Syd Field, one of our more successful screenwriters, further structures Aristotle’s three-act play by defining two primary events he calls plot points. The first occurs 1/4 way through the story, which is: “a dramatic and unanticipated escalation in the conflict.” In the movie Groundhog Day, this is that first morning when Phil learns that Groundhog Day is repeating. We realize that Phil is not pleased with himself, and it becomes obvious that he is going to relive Groundhog Day until he changes and gets it right. It’s an internal conflict that’s resolved at the end. To add more definition to the storyline, we’ll turn again to Irwin R. Blacker. Everyone appears to realize that story involves conflict, but they seem to say just throw conflict at it and where it sticks, use it. We would like to have something a little more insightful, and Blacker is one of the few who provides definite instructions concerning conflict. According to him, the first thing your story should do is “lock the conflict.” The protagonist and antagonist must engage in conflict, however remotely, for the story to begin. In police procedurals as either TV episodes or movies, in the initial scene, someone finds a body. If the murderer is still standing at the scene and gives up, there is no story. If the murderer runs, this act locks his/her conflict with the police. This then is the battle that will continue throughout the story and be resolved at the end when the police catch the murderer. It bounds our story. We now know how to begin and end a story: lock the conflict, resolve the conflict. This of course implies a central conflict that provides the story arc. I will add another plot point right in the middle of the story. This comes, not from any advice from some internationally famous storyteller, but from a professor I had at the University of Colorado where I was taking classes in American literature in the late 1970s. I verified it with decades of my own research. It is a reversal in the action, i.e., the central conflict, and it occurs at the midpoint in the story. As a rather simplistic example, if the protagonist has been chasing the antagonist up to this point, then the antagonist will start chasing the protagonist afterward. You can see this reversal in novels as well as movies. While reading James Fenimore Cooper’s The Last of the Mohicans, my professor pointed out that the Indians chase the white guys for the first half on the novel, and the white guys chase the Indians in the second half. I then noticed that in Spielberg’s Jaws, the fish chases the people for the first half of the film, and the people chase the fish during the second half. Twenty years later, I realized that in Cameron’s Titanic, the ship floats during the first half and sinks during the second half. This is also where Rose decides to abandon her mother and fiancé and go with Jack. As a matter of fact, during the first half of the film, Cameron shows us every thing about Titanic. We have a long excursion on deck, and even go down into the engine room. In a sense, he is putting Titanic together, building it. Then, right in the middle of the film, Titanic hits an iceberg, and during the second half, Cameron tears it apart and sinks it. The reversal should occur naturally and not be something you have to force on your story. It is the nature of storytelling, thus the nature of conflict. Which then dictates that Cinderella chase the prince in the first half of the story, and the prince chase her in the second half. If the reversal doesn’t intuitively show up in your story structure, you might question how well you know your story. No one talks about the mid-point reversal, but it happens in all well-told stories, otherwise the conflict wouldn’t be balanced or fully explored. I would add two more minor events to our plotting technique. First is the initial setup, which should be quite short. It’s what precedes locking the conflict — maybe getting to know the protagonist and/or the antagonist a little before the action starts. The other thing is the denouement. That’s what comes after the resolution of the conflict and shows the aftermath of the conflict. Again, very short. 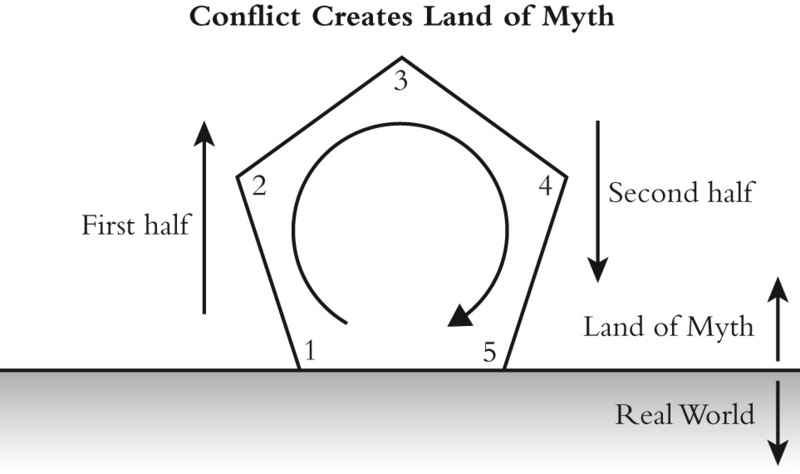 When we renumber our plot points, the storyline as an evolution of the central conflict looks like Figure 3-2. This graphical representation looks appealing and has all the components mentioned by master storytellers from 400 BC up until today. This constitutes a complete idea for a story, and unless it has all these components, including the premise, the concept is incomplete. The author explores her/his idea for a story using this plot diagram as a guide to uncover its inherent structure. We need to look a little closer at Plot Points 2 and 4. PP2 is the time in the story where both the central conflict and therefore also the theme are fully exposed. Theme and conflict are always inexorably intertwined. In Titanic, PP2 is when Jack asks Rose why she thinks suicide is her only way out of the shackles imposed upon her by her family. Freedom is an option, he tells her. PP4 reveals something about the theme that gives a clue to the outcome. This is usually the point where the protagonist solves the riddle of how the theme specifically applies to him/her. It involves agony of choice. In Titanic, this is where Rose climbs out of the lifeboat and goes back to get Jack. She’s decided to go with him because he advocates a life of freedom. He and the lifestyle he offers are more important to her than family and friends, and even her own life. PP2 and PP4 say more about the theme associated with the central conflict than any other events in the story. Before we proceed, I should say a few words about why stories should generally have this structure. The answer comes from the basic nature of conflict and the requirement that it be sustained for a prolonged period of time for it to be interesting. Conflict may well be the central element of life on Earth. Its most basic manifestation comes from the need to feed. Life forms eat each other. From there conflict spreads out to what is in the best interest in the individual and then the community in which we live. Through the millennia, this is the form that human conflict has taken on in the average. This structure for conflict is the graven riverbed humanity has traveled down through the ages. Some call the straight-line plot of Figure 3-2 the “iron bar” that you drive through your story. It does have actionable components and is directly character-related, but it also has a rather pedestrian quality, and we’re not looking for just any old plotting method. We’re looking for something exceptional to illustrate the procedure. This alchemical-like activity needs a concrete symbol to give our method added meaning in the world of storytelling. Alchemists were big on symbols and when their magnum opus involved twelve procedures, they used symbols from the Zodiac. We have five “procedures” and would like to convert our iron bar into something symbolic of our process. In short, we would like to transform this linear diagram into a symbol, the study of which would reveal more of the secrets behind the art and craft of storytelling, the alchemy, something that alludes to or even captures the mysticism of conjuring the activities of fictional beings. To get there, we’re going to have to perform a little alchemy on our plot diagram, and this step requires some faith and inspired thinking. So put on your alchemist robe, tiara and leather sandals, etc. What I’m going to suggest we do with our storyline, this iron bar, is to pick it up and bend it until it forms a complete circle. This might require a little heat in the alchemist’s furnace, pumping the bellows, and pounding on an anvil to join the ends where the setup and denouement meet. 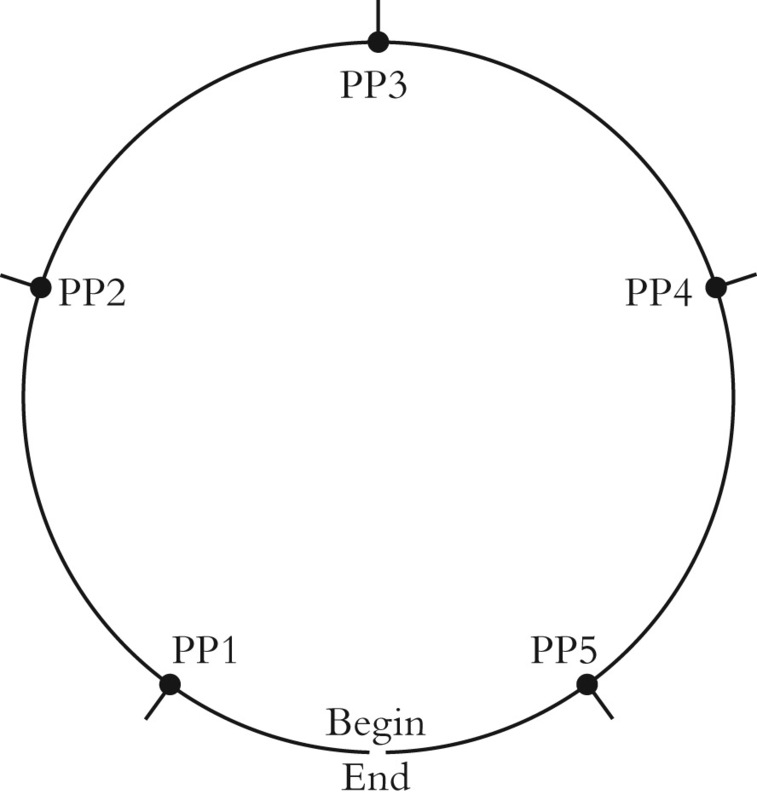 We then have a two-dimensional circular representation of our storyline that looks like Figure 3-3. Now let’s take it a step further by connecting the dots, i.e., connect the plot points with straight lines, starting with the one that represents locking the conflict, PP1, and continue around the storyline in this manner until we have connected “locking the conflict” with “resolving the conflict.” Since both the “setup” and “denouement” are short, they will form one line together. Now we have something far from pedestrian, a five-sided geometrical figure called a pentagon. See Figure 3-4. We navigate the pentagon clockwise when telling the story. The plot pentagon is not so much a diagram as a geometric object and symbol that represents not just one but all stories. It represents the most basic underlying structure of storytelling. The plot pentagon is composed of actionable elements because it is directly related to the conflict at the center of the story. That’s a profound statement and a lot to grasp all at once. We have uncovered, one might actually say discovered, the basic form of plotting. The pieces of an emerging archetype that presented themselves as plot points identified by master storytellers over a period of 2,400 years have coalesced into the defining structure that symbolizes story structure. Just as Sir Isaac Newton formulated his three Laws of Motion, we now know the basic structure of storytelling. This symbol represents the energy inherent in a well-told story. And notice that we haven’t positioned the premise anywhere on the plot diagram. That’s because it is never mentioned specifically in the story even though it influences every point along the circle and in particular every plot point. That doesn’t mean that we won’t talk about the theme of the story from time to time, but it does mean that we won’t address this philosophical underpinning including the outcome overtly. We’ll find the proper place for the premise within our plot pentagon, and it plainly does have one, in just a moment. The bottom of the pentagon, the side that sits on the ground, so to speak, has its origin in the yin-yang concept from Chinese alchemy, which is a joining of interdependent opposites to form a whole. It contains the beginning and ending of the story. The story starts somewhere along this side of the pentagon and proceeds clockwise to the first apex. As a matter of fact, the entire outline of the pentagon represents the time flow of conflict as indicated by the curved arrow. See the Figure 3-5. At this point let’s take a second to realize that if the conflict is mediated immediately and resolved, we have no story. The yin-yang remains joined. We’ve missed an opportunity. All this goodwill is the death of story. It takes some hard-nose resistance and animosity to get a story going. However, if this congeniality over the conflict doesn’t materialize, the yin-yang separates, and we’re in business. Plot Point One, PP1, locking the conflict, lifts the story off the ground, lofts it by virtue of the emotional tension created, and sends it soaring into the Land of Story. At the apex, PP3, it reverses direction, as we said it must, and comes screaming back down toward normality where the conflict will be resolved at impact, PP5. The line connecting PP5 with PP1 contains no conflict and represents grounded normal reality. The Land of Story, as the habitat of all myth, ancient and modern, is an ephemeral psychic space that exists in the fertile soil of the imagination. To bring your story to life in that psychic landscape, the leavening ingredient is conflict. The story contained within the pentagon exists within the Land of Myth, and we will explore that world in depth in succeeding chapters. If we take this smaller pentagon as symbolic of something else going on in the story, and remembering that the pentagon represents conflict, it signifies that the external conflict between the protagonist and antagonist raises conflicts internal to each of them, something we already knew but can now symbolically visualize. Most people try to avoid conflict, apprehensive of what they may have to do to resolve it in their favor. This leads to soul-searching that the person must deal with to become fully engaged in the external conflict. The reason it’s pointed in the opposite direction is that this conflict is a resisting response to the character’s central plot conflict. This at least is one possible interpretation of the internal pentagon. 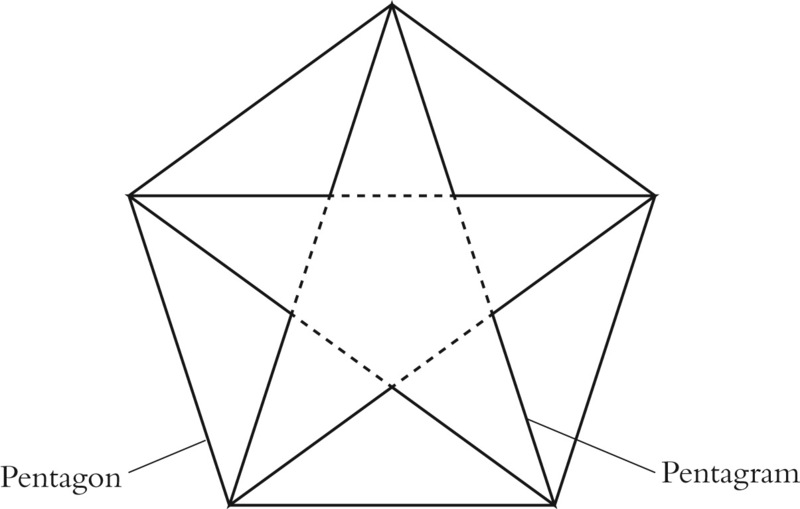 At this point, the careful reader will notice that connecting the plot points on this internal pentagon will produce another, even smaller, pentagram and pentagon inside the original ones. Indeed, we can continue this stellation process indefinitely. However, since each pentagram/pentagon gets smaller and smaller, we might suppose that this represents uncovering different layers of personal values or psychic states and religion or spirituality. As far as an individual is concerned, we see that it has infinite depth, and if one were to accept the beliefs of many religious disciplines, somewhere inside, we’d find God. We can also extend the lines outside the pentagon, as in Figure 3-7, to see where that leads. At first, it creates a larger pentagram, and if we then connect its points sequentially, we have created another larger pentagon outside the plot pentagon, but again one that points in the opposite direction. What would all this external geometry mean relative to the story? This is a verification of something we already knew, i.e., that our characters may be related to a cosmic struggle. The protagonist may represent good, and the antagonist evil. In this way, we might also envision encountering God and something or someone in opposition to him out there. It would seem that somehow our story has doubled back on itself, the external becoming the equivalent of the internal, a concept you might keep in mind as we go forward. This also represents the universal being reflected in the particular and is simply another way of saying that, within the symbol we’ve created, the macrocosmic meets and integrates with the microcosmic. We now know that all properly structured stories have both philosophical and psychological dimensions that give them universal as well as deeply personal significance. When properly told, all stories resonate in this way even though they don’t necessarily speak openly to these other levels of meaning. The plot diagram based on conflict is the mechanism for investigating theme and providing meaning, and at each of the five plot points, the protagonist must learn something about her/himself. The antagonist may learn something also, but our main focus, at least for now, is the protagonist. These insights, obtained from the plot pentagon, help to fully flesh out not only our characters but the philosophical nature of the events described. The really strange, one might even say mystical, part of it is that this relationship between our plot and the pentagon doesn’t feel forced. The alignment of story elements and the geometry of the pentagon isn’t just coincidental. It’s as if the pentagon and story structure are the same entity. Newton’s Laws of Motion describe rather perfectly the dynamics of objects in the real world. The connection between mathematics (including geometry) and the natural world is a mystical one that surprised the ancient Greeks when they discovered it. 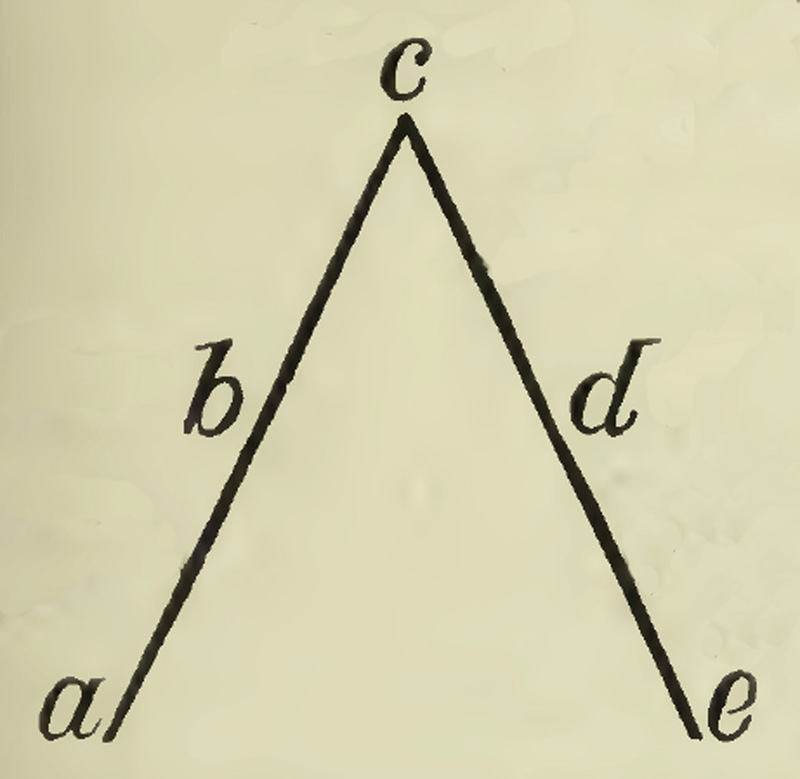 Pythagoras played around with music and discovered the mathematical underpinning of its nature, e.g., the musical intervals of the diatonic scale. He famously said “all nature consists of harmony arising out of number.” [Sir James Jeans, Science and Music, page 154.] Songs have had structure, or “geometry,” for hundreds of years. The sonata rhondo form is one example from classical music. In popular music, the thirty-two bar form with four eight-bar sections, AABA, is frequently used. Is it any wonder then that stories also have structure? Pythagoras’ statement applies to storytelling — geometry explains it all. Just as Newton discovered the elements of motion — force, location, acceleration, velocity — so we uncovered the elements of story, that its basic nature is conflict. 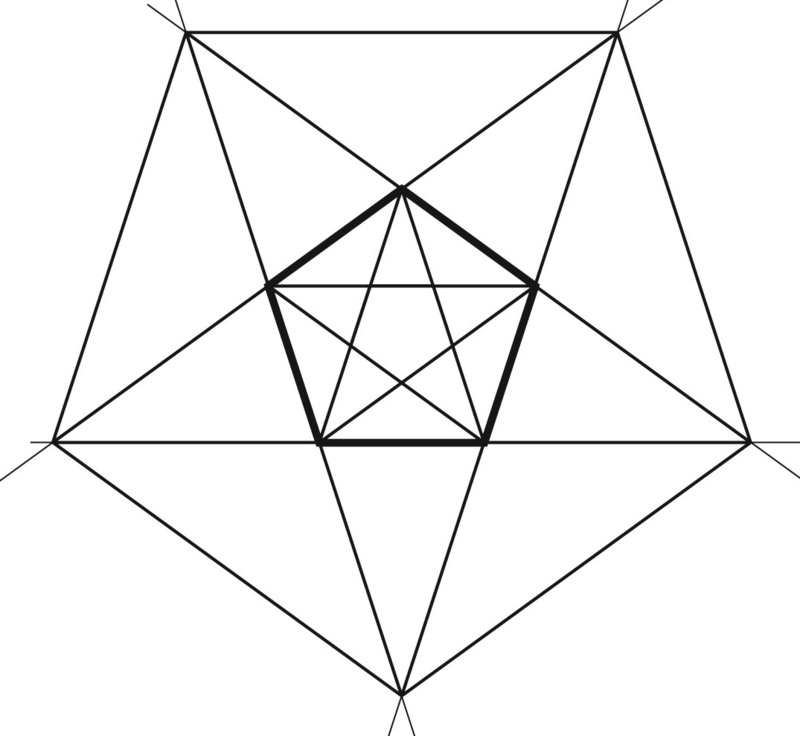 Another way of describing this stellation property of the pentagon is to term it “self-regenerating.” As a simple geometric object in one plane, it signifies the possibility of an infinity of planes both lower and higher that starts to look a little like a wormhole. But that’s not the end of its self-regenerating qualities. The fact that it was created in association with a circle and has a clockwise time flow means that it is unending — the end leads to a new beginning. This timelessness is a property of the Divine World, something we’ll need to discuss further later. The fact that conflict and theme are so indelibly linked gives rise to another pentagon — that representing the progressive unveiling of the central theme. Theme has to do with the protagonist gaining insight and awareness, an act of consciousness raising. Describing the conflict and how it progresses is a necessity, but at the same time, the author must delineate the protagonist’s struggle to gradually become enlightened. This feeds directly into the author’s own awakening as a part of becoming worthy. You might not quite get the connection yet, but it will become unmistakable a little later. Of course, this isn’t the first time someone proposed a five-act dramatic structure. Most notable is Dr. Gustav Freytag who did so in his Technique of the Drama (1900). Unfortunately, he didn’t relate his structure directly to conflict, nor did he describe his five acts as a pentagon. He likened his plot structure to a pyramid. His five acts are (a) introduction, (b) rise, (c) climax [apex of the pyramid], (d) return or fall, and (e) catastrophe. He also referred to an “exciting force” that drives the action but did so without an actionable definition; however, it most certainly is conflict. All this plus his description of what goes on inside characters is the best I’ve read. It’s a book well worth reading. The apparent connection between our plot diagram and Kübler-Ross’s research is no coincidence. We experience life as story. We are mythical beings, and when confronted with something that seems so contradictory to our being, we have to experience it within the framework of story to fully resolve the internal conflict and emerge with a sense of meaning provided by this, the final event. Given time to accomplish this, it is the way we die. This is the way our psyche comes to terms with death. And although it may fit this five-stage pattern, each individual’s experience will be unique. We can also learn something more about the complexity of storytelling by listening to what she says about the purity of these stages. None occur as distinct, separate phases. “These [coping] means will last for different periods of time and will replace each other or exist at times side by side.” [page 138] We can generate a plot pentagon for our story, but in the end, we must allow the story to seek its own course through the emotional turmoil. 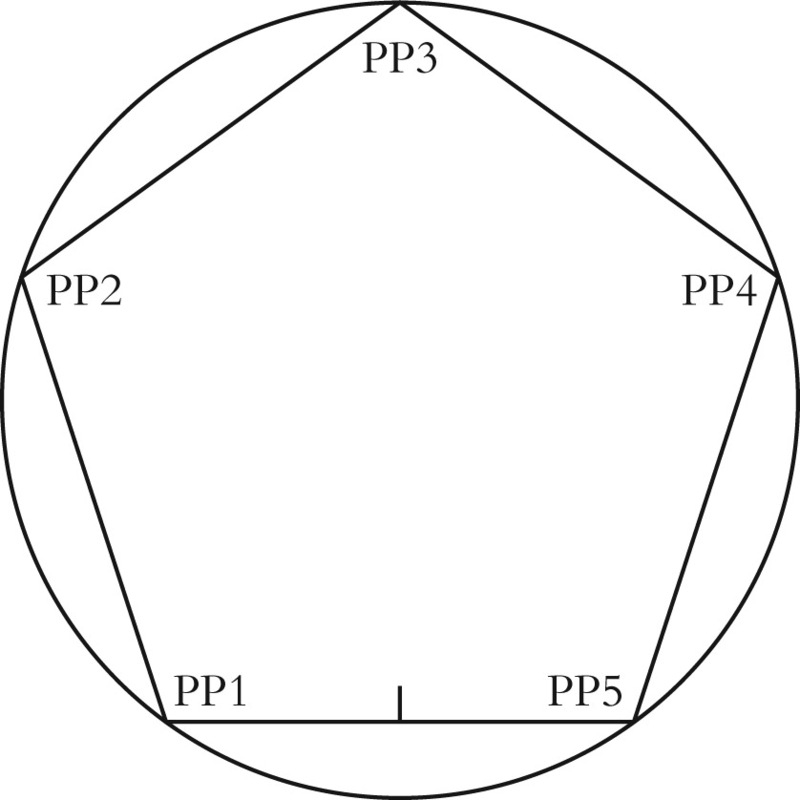 We might also envision the internal and external pentagons we could generate from Figure 3-9 by stellation. These larger and smaller pentagons and pentagrams would represent the internal conflicts and external issues (intellectual, psychological, moral) relative to those of external, real-world issues (spouse, family, friends, hospital, politics). This may also play out in a normal life span. I believe what happens to solve this grief complex is that we are in a state of denial most of our lives. As we get older, we gradually see the end of our lives coming toward us, and we get mad about it, about aging. But we still have some time left, so we do things to make the most of it by entering the bargaining phase. When we become geriatric, we frequently become depressed. Many of those around us have passed on, and we can see the end of our road clearly and inevitably. But as it draws nearer, we come to accept it. Those of us who are more aware may go through this process naturally and continuously, so that in the end, it isn’t such a shocking, emotionally turbulent time. It seems that when we suffer a premature death, the grieving process must occur over a much shorter time span, and it becomes more obvious. If we die in an accident, we don’t get a chance to go through the grief cycle, nor do our friends and family, and that is indeed a problem because it is a normal part of the human experience. This is the struggle between life and death. Death always overcomes life. 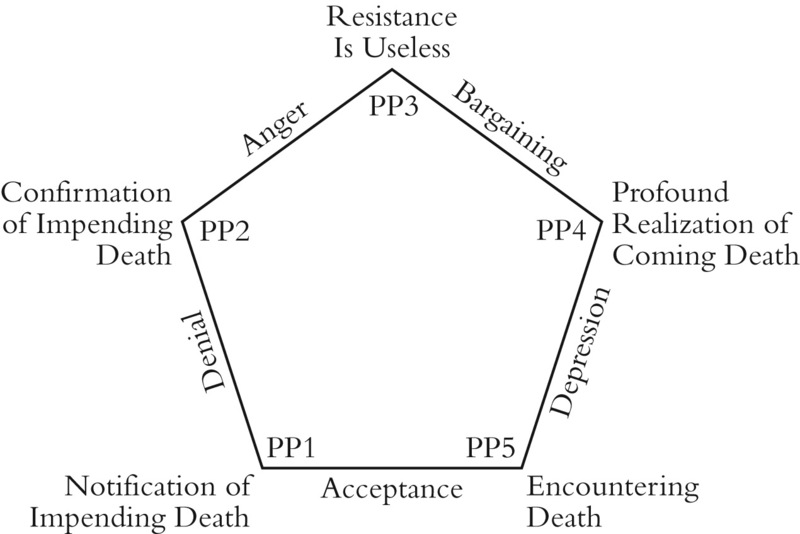 Death is not the only event that generates the five stages of grief. Divorce, loss of a job, a financial setback, all such events can trigger the grieving process, although they will not necessarily be experienced quite so profoundly. But here’s the main point. We are mythical beings, and the plot pentagon is the complete paradigm for the way we live out the conflicts of our lives. Is the plot pentagon the Philosopher’s Stone for storytellers? Not by a long shot. Although intriguing, it’s a flat, two-dimensional object. We still have a ways to go before we come to something that profound. I’ve alluded to the fact that it seems to have a mystical quality, and relative to that statement, we’ve only begun to scratch the surface. Although not the Philosopher’s Stone, I realize that discovering the plot pentagon is a big thing. Notice that I said “discovered,” not created or developed. This is a discovery of something that has always existed. We found this symbol as if it were a physical object lying on the ground on which we stubbed a toe. When we first bent the storyline “iron bar” and joined the “setup” with the “denouement,” we formed a circle. To summarize a little, that circle represents the complete storyline whereupon we positioned the plot points. Plus, it’s self-regenerating and has a coincident beginning and ending, and that property makes the circle look a lot like another object, the first example of which archaeologists found in an ancient Egyptian funerary text from the 14th century BC, in the tomb of Tutankhamen. Plato also mentioned this object in the Timaeus. It was the most basic symbol of alchemy for 1,500 years, and Carl Jung tells us that it spontaneously appears in drawings by patients undergoing psychotherapy. It is frequently an element of a mandala. This is the Ouroboros or serpent/dragon eating its own tail. The pentagram makes something else obvious. Its five spires seemingly radiate out from the center of the circle, which is also coincident with the center of the pentagon and pentagram. This center of all activity now becomes our focus, and we shall spend some time discussing it because it’ll require a little Hinduism and Buddhism to help us understand it. And you’re right. This is the point in The Matrix where Morpheus brings out the red and blue pills and asks how far down the rabbit hole you want to go. And you better not lean over too far, Alice, because you’re about to fall in, and when you do, it’s a scary place with no way to turn back. Once you’re in, you have to fall all the way through the Earth and come out the other side. Here, Neo, are your alternatives: Take the blue pill, and you can go back to the way you’ve always told stories, augmented of course by what you’ve already learned about plot structure. At least you’ll take away something that will substantially improve your storytelling ability. Still, a ho-hum existence for an author, who could have learned so much more, but a safer state of being. Take the red pill, and you’ll uncover all that’s behind good storytelling, but you’ll also end up learning more about yourself than you ever wanted, and possibly even more than is good for you. It will change you, and perhaps you’re happy with the way you are. And it’s not necessarily a safe trip either. Once you’ve fallen into this rabbit hole, you may need a therapist to find your way out. I had to make that same decision. I chose the red pill and jumped off into the rabbit hole. I then spent a year learning and practicing a technique to probe the Unconscious (we’ll discuss that later), following which I spent another two years delving into the far reaches of my own psyche digging up creative material for a vampire novel. But I had already spent five years in therapy with a bona fide and experienced psychiatrist. Plus, I’m older than most who will read this book, and with age comes a certain psychic stability that one doesn’t necessarily have earlier in life. This is particularly true for someone going through a stressful personal situation or perhaps midlife. I know of at least three periods in my own life that seeing what I’m about to show you would not have been in my own best interest. You can take it from me that when you pull back that curtain, Dorothy, you won’t see a shriveled old man turning the handle on a steam-punk engine. You’ll come face-to-face with the abyss. Remember that episode of Buffy the Vampire Slayer [S6:E17] where Buffy is in an asylum having suffered for many years from a schizophrenic event within which she’s imagined a fictional world where she’s the Chosen One and this other, psychiatric-ward world is the real one? In the hospital room, with Buffy huddled in a corner, her mother tells Buffy to have faith in herself, that she’s strong enough to whip the schizophrenia and keep her mind in the real world. With this vote of confidence, Buffy says, “Thank you,” and then goes back into her delusional vampire world where she is a superhero and has to regularly save the planet from a demon apocalypse. I can’t guarantee you’ll make it back out in one piece. This may seem overly dramatic, but where we’re going is quite probably uncharted territory for you, Mr Anderson, and this is a genuine warning. The search for the Philosopher’s Stone is serious business. Red pill? Blue pill? Your choice.